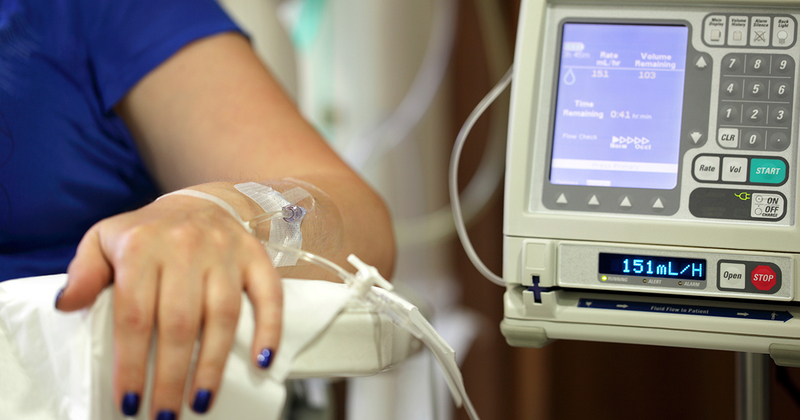 Chemotherapy uses drugs to kill cancer cells. Most people with pancreatic cancer get chemotherapy. For early pancreatic cancer, chemotherapy is usually given as adjuvant chemotherapy after surgery, but in some cases, it is given as neoadjuvant chemotherapy, or before surgery. For advanced cancer, chemotherapy is used alone, or with radiation therapy. Chemotherapy for pancreatic cancer is usually given by vein (intravenous). The drugs enter the bloodstream and travel throughout your body. Chemotherapy may be given in an outpatient part of the hospital, at the doctor’s office, or at home. Rarely, you may need to stay in the hospital. Blood cells: When drugs lower the levels of healthy blood cells, you’re more likely to get infections, bruise or bleed easily, and feel very weak and tired. Your health care team will check for low levels of blood cells. If your levels are low, your health care team may stop the chemotherapy for a while or reduce the dose of the drug. There are also medicines that can help your body make new blood cells. Hair Loss: Chemotherapy may cause hair loss. If you lose your hair, it will grow back after treatment, but the color and texture may be changed. Other Side Effects: Chemotherapy can cause a poor appetite, nausea and vomiting, diarrhea, or mouth and lip sores. Your health care team can give you medicines and suggest other ways to help with these problems. They usually go away when treatment ends. Some drugs used for pancreatic cancer also may cause tingling or numbness in your hands and feet. Your health care team can suggest ways to control many of these side effects.